In my book, My Parent Plan, I mention that it is important to look at your purchases throughout the year, create a budget and then create a shopping plan. 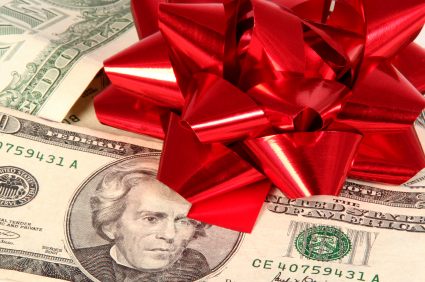 For the holidays, this includes your holiday gift budget. If, like many, you have a tighter budget this year than in past years, then consider giving the gift of “time”. Take a friend’s kids for a night so they can go out, cook your special food for someone you care for, work together with the kids to create crafts for teachers, and other creative and budget-friendly gifts. One of our relatives gives our kids the gift of individually planning a day out at a museum or other community event. The kids love spending private time with this relative and without their siblings. The gift of spending time together with family or friends is priceless! After you have identified your annual gift list and budget, then start to get an idea of how prices change by location and time. Consumer Reports, LifeHacker and other websites published reports on the best time to buy different items. Many may think that Black Friday and CyberMonday are the only days to get deals but that is not true for all items. For example, I have been looking for a desktop computer to replace my two year old work laptop. I started pricing during BlackFriday and Cyber Monday sales and for the type of powerful desktop I am looking for, the stores were only offering $100-$200 off. Last year, the New Year’s sales were even better so I am going to take my chances and shop for a new desktop in the beginning of January. At the same time, I will also keep track of the pricing in December just in case I see a really compelling sale. To automatically keep track of pricing, I am trying out product tracking sites including Digital Folio, CamelCamelCamel and others. Using these sites, I have been following the prices on a few appropriate desktops, including the Lenovo IdeaCentre K450, that fit my top work computing requirements of a fast processor (Intel i7), 2TB hard drive, 12GB RAM and Windows 8 . From the price analysis on the CamelCamelCamel website (that matched with my other research), the lowest price the whole year was $848, the highest was over $1,000 now the price online is $898. Then, I checked the Lenovo website and realized that some CyberMonday deals were going on until Dec. 6th offering a price of just over $800, a really great deal. Because my holiday purchase budget was already spent, I’ll likely make this purchase in January, waiting to see what deals come out for the New Years sales. I now know that $800 is the lowest price I found so if it’s close I’ll be ready to buy! 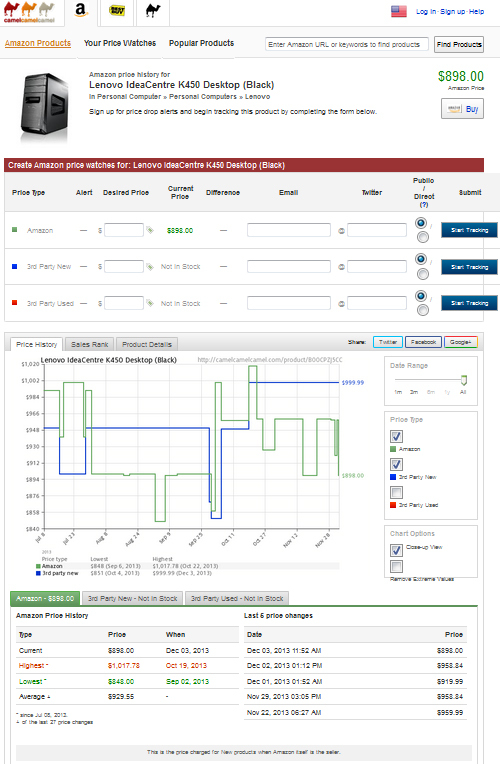 Lesson learned is that all price trackers can not monitor of all the special holiday pricing. It’s therefore a good idea to first identify your budget and what you want to buy, then use the price trackers and product manufacturer’s website to get an idea of pricing during holiday sale time. Black Friday and New Years sales have lots of “in store” sales as well, so setting yourself up for mobile shopping is essential. Here are some of the tools to prepare for using technology to shop while on the go. Shopping Comparison Sites: Along with price trackers mentioned above, there are many other sites including Google, Bing and others to help find and compare pricing. ShopSavvy is an app that can be used to find items, prices and use a barcode scanner in store (iPhone, Android, and Windows Phone). Coupon Apps: RetailMeNot and Coupons.com (will add links to apps) are just a few of the apps that can be loaded to your smartphone to show in-store and online discount codes. I especially enjoy using the RetailMeNot app at Kohls, which usually helps me get an additional discount off the full amount of my purchase! Mobile WiFi- When I was shopping the New Year’s sales last year I found some new items that met with my product specifications but were not on my initial list. I also found that having my own mobile WiFi in the store gave me more freedom to check pricing and product information regardless of my location. I also used this as a bargaining tool. At one tech store that says they “match” prices, they honored a lower price I showed them on my laptop using my AT&T Unite mobile WiFi. On the topic of shopping, I am putting an AT&T Unite on my list as a gift for my teen since using my mobile WiFi always impresses his friends). So I think it is time for my teen to have his own mobile WiFi device. How do you plan for shopping to find the best price? Disclosure: This is a sponsored series. I received an AT&T Unite as part of my sponsorship. My words are my own. 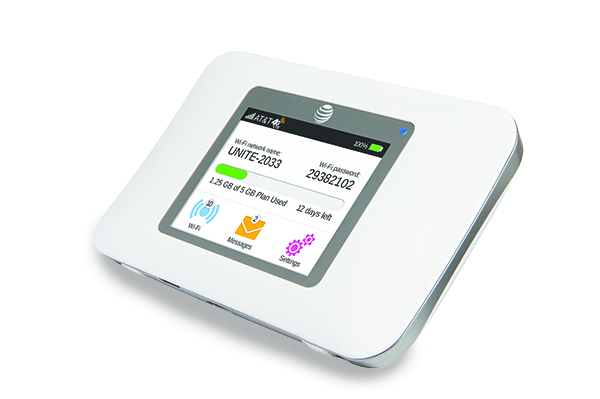 For more information, visit att.com/Unite or connect with WiFi Family powered by Netgear.